Discussions about raising the minimum wage for workers often generate maximum rage from business. But is there any truth to the arguments and fear mongering? Let’s take a look. It’s hard to miss the reports predicting job losses as a result of the minimum wage increase, from the Bank of Canada’s nation-wide 60,000 to the somewhat more alarmist 150,000 from TD, and the hold-my-beer 185,000 estimate from CANCEA (for the Ontario Chamber of Commerce). As Michal Rozworski explains, these eye-popping numbers do not represent pink slips; they are estimates of how job creation could slow as a result of increased wages for our lowest paid workers. And, as we’ve demonstrated, these reports often exaggerate job impacts and ignore newer economic research. ? This past summer, 53 Canadian economists signed a letter supporting the Ontario government’s move to bring the minimum wage to $15 an hour. They say the fear mongering is out of line with the latest economic research. As for job losses being a foregone conclusion, economists Jim Stanford and Jordan Brennan examined minimum wage increases in 10 provinces over 30 years and found no consistent connection between a higher minimum wage floor and employment levels in Canada. This reflects similar findings in the U.S., the U.K, and Australia. A $15 minimum wage in 2019 would only be $1 more than the 1977 minimum wage when adjusted for inflation. Low wage work is concentrated in food services, retail and industries like call centres and cleaning services. As David Macdonald outlines in his report, “someone getting a raise in retail, food, or accommodation jobs is three-and-a-half times more likely to work for a big box store than for a mom-and-pop shop”. Contrary to business lobby rhetoric, the minimum wage isn’t a small-business killer — it’s predominantly a big business issue. We’ve got a very good grasp of who will benefit from the increase. This increase improves the lives of the one in four workers in Ontario who make less than $15 an hour. They’re mostly working adults: 82% are aged 20 and over. A $15 minimum wage will have a dramatic impact on families across the province, and workers who have traditionally been marginalized, including off-reserve First Nations and Métis workers, racialized workers, women, and immigrants. And it will reduce income inequality in Ontario’s labour market, where the bottom half of working families have been losing ground. In other words, a $15 minimum wage will improve the lives of over a million Ontarians, their families, and the communities in which they live and spend their money. And it will ensure a more stable and adequately paid workforce, which is good for business too. As Armine Yalnizyan points out, businesses raise their prices frequently without the minimum wage going up. Sheila Block notes that a hurricane in Florida can increase the price of oranges, increasing costs for restaurants and grocery stores, as would a frost in Brazil or Costa Rica. And isn’t it curious that the minimum wage gets blamed for price increases — but never the record-high level of CEO compensation, as our 2018 CEO report demonstrates. 8) But what about the robots? 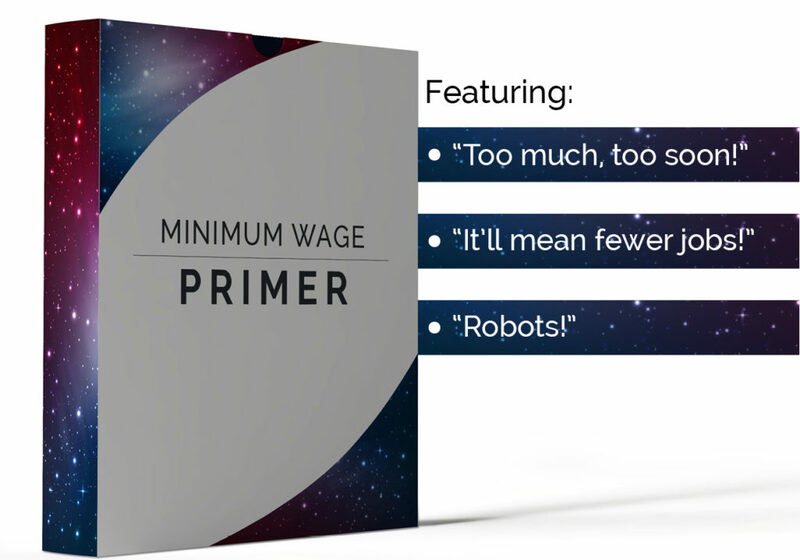 Automation isn’t a new trend and it’s happening independent of wage increases. So while it has and will continue to have significant implications for how we work, it should not be confused with debates over whether or not we should compensate people with a good wage for the work they do. Keep in mind: when banks moved toward automated tellers, a lot of those teller jobs got turned into higher paying, higher skill jobs such as portfolio managers. No, the minimum wage increase does not propel workers into a higher tax bracket. It merely gets workers closer to a living wage, which some employers — the Ontario Living Wage Network and the Better Way Alliance, for example — have already been paying, while championing the minimum wage increase for all workers. Sure, we agree with an increase in principle, Corporate Ontario explains. It’s just that this particular increase right here? It’s reckless. Sudden. “Too much, too fast” (or “too much, too soon”. Or the mashup “Too much, too fast, too soon”). The Ontario government gave businesses seven months’ notice that it was going to raise the minimum wage to $14 an hour on January 1st of this year — and businesses have an entire year to plan for the next step to $15 an hour by January 1, 2019. And it’s not like a $15 minimum wage came out of nowhere. It has been the goal of the two-year “Fight for fifteen and fairness” campaign in Ontario. It’s been debated and implemented in Alberta and in various American cities, as well as in Britain and Australia. Did Ontario businesses really think they could sit this one out? 12) Same old business lobby objections? As David Bush documents, business lobby objections have been steady for decades—they just keep trotting out the same arguments. Heard any of these before? 1962: The business lobby claimed restaurant prices would have to increase. 1987: They claimed it could mean fewer jobs for teenagers. It might be time to rethink those talking points. It’s not — or it shouldn’t be — a secret that low wage workers have been losing ground in Ontario. We also know that precarity is on the rise — half of workers in the Greater Toronto and Hamilton area are employed in precarious jobs — to which the province’s Changing Workplaces Review was intended to respond. We could fall for resuscitated arguments from the business lobby about why giving our lowest paid workers a raise will result in no one eating in restaurants ever, or societies capitulating to armies of robot workers, or $15 lattes. Or we could recognize that, given research findings and the numerous positive experiences in other jurisdictions, such warnings are overblown and unwarranted. And we can do what’s right — and long overdue — for workers, families and communities across the province. Erika Shaker is director of Education and Outreach for the Canadian Centre for Policy Alternatives (CCPA). Trish Hennessy is director of the CCPA-Ontario.